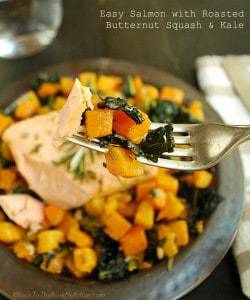 Butternut squash are one of my favorite fall foods – in fact, this simple roasted salmon, squash, and kale sheet pan dinner and this roasted winter vegetable soup are two of my favorite ways to eat them. But I recently discovered that butternut squash also make a great seasonal substitute for oven fries, especially with a bowl of easy, Rosemary Garlic Aioli for dipping! In fact, just after these photos were taken, my daughter and I polished off almost the entire batch for lunch before anyone else even got a taste. Oops. It’s alright – the guys will get their chance. I’ll definitely be making them again before autumn comes to an end! And that aioli? It makes a killer substitute for mayo on a burger or roast beef sandwich – definitely making a double batch next time! If you’re interested in making the aioli with homemade mayo, you’ve got to check out Tiffany’s fail-proof 2 minute mayo recipe! I like it with lighter flavored oils like avocado oil or walnut oil. If you’re buying mayo, Primal Kitchen Mayo is my favorite store bought brand – a little pricey, but by far the healthiest and best flavored one I’ve tried! Butternut squash also make a great seasonal substitute for oven fries, especially with a bowl of easy, Rosemary Garlic Aioli for dipping! Heaping 1/2 cup homemade or store-bought mayo this is my favorite store-bought mayo! Divide uncooked fries between two roasting pans (I like to line mine with this unbleached parchment paper). Drizzle with melted ghee, then massage with clean hands until evenly coated. Spread fries out across pans evenly, then sprinkle generously with house seasoning. Roast for 45 minutes, turning halfway through. While the fries are in the oven, mix together all aioli ingredients and set aside. Leftover aioli can be covered and stored in the fridge - it makes a great sandwich spread! Check out these other great fall recipes! I never imagined making fries out of butternut squash, it sounds incredible! Especially with the rosemary aioli! Thanks, Athletic Avocado. We sure loved ’em!